Philadelphia Weight Loss Is a calorie a calorie? 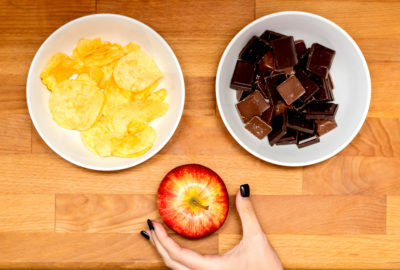 Is a calorie from an apple the same as a calorie from potato chip? While most people intuitively know that an apple is “healthier” (It has vitamins, fiber and bulk to help keep you full), when it comes strictly to weight loss, the answer is hotly debated. However, the laws of thermodynamics cannot be, and if you consume fewer calories than your burn (no matter where they come from), you HAVE to lose weight. Put it into action: The best way to figure out how many calories you need is to weigh yourself every morning for two weeks. During that time, track everything that passes your lips that has calories without making conscious changes to your behavior. Then after two weeks, look at your caloric intake vs. your weight and you will know what you need to do. The bottom line: You need to consume fewer calories than you burn in order to lose weight. Doing so by changing as little as possible gives you the highest chance of long-term success. Research suggests the leaner and stronger you are, the longer you will live. Thoughtful choices every day will guide you to your personal weight loss goals. For more tips on weight-loss and life balance, stay tuned here and on our social channels.